Researchers say it's all part of Russia's plan to expand its agricultural sector. News outlets funded by the Russian government may be responsible for a series of “misinformation attacks” on genetically modified organisms (GMOs), according to researchers at Iowa State University (ISU). Many crops in the U.S. are genetically engineered; roughly 90 percent of corn and soybeans, among others, are modified to resist pesticides. The two ISU researchers stumbled upon their findings quite accidentally — they had originally intended to study how U.S. media outlets portray genetic engineering and biotechnology. The duo then decided to include U.S. versions of RT and Sputnik, news outlets that are supposedly funded by the Russian government. It turns out, these two outlets dominate GMO news. “RT accounted for 34 percent of the articles we scraped, followed by Sputnik (19 percent), Huffington Post (18 percent), Fox News (15 percent), CNN (8 percent), Breitbart News (6 percent), and MSNBC (<1 percent),” the authors wrote in their study, which is yet to be peer-reviewed. Sociologist Shawn Dorius and genetics, development, and cell biology associate professor Carolyn Lawrence-Dill presented their findings at the annual meeting of Iowa State University’s Crop Bioengineering Center. The purpose of that vein of coverage, Dorius and Lawrence-Dill argued, is simple: To foment confusion and spread misinformation. The Russian-backed news articles touched on various anti-GMO claims, including possible health risks, negative socioeconomic consequences for developing countries, and environmental concerns — essentially any arguments that would show GMOs in a negative light and suggest Russian crops as an “ecologically clean” alternative. It’s all part of Russia’s plans to expand its agricultural sector, the researchers said. “That’s a primary interest, but there are multiple interests. One of which is to stir up division in the U.S.,” Lawrence-Dill told USA Today Network affiliate Des Moines Register. The debate on whether GMOs are safe or not is already divisive enough as it is. In the U.S. only 14 percent of the public truly understand the science behind GMOs and that that majority of scientists maintain that GMO foods are safe for human consumption. The ISU researchers suggest that Russia may be intentionally muddying the waters as far as GMOs are concerned by highlighting the public’s inherent distrust over genetic engineering in general, not just about modified crops or livestock. 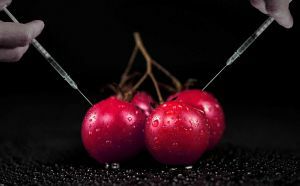 “The extensive nature of Russian news portrayal of GMOs reflects a deep understanding of the psychological antecedents of public distrust in bioengineering and an intent to more firmly link these antecedents in the public consciousness,” the study notes. These Russian news outlets may indeed be biased, but according to anti-GMO website Sustainable Pulse, so are Dorius and Lawrence-Dill. In a recently published article, the group argued that the ISU report’s authors work at a lab partly funded by the U.S. National Corn Growers Association (NCGA), a known “pro-GMO” group. At any rate, the ISU study comes only a week after three Russian companies and more than a dozen Russian nationals were recently indicted for supposedly interfering in the U.S.’s most recent presidential election. It’s also worth noting that GMOs are banned in Russia, as the country claims to be the world’s leading organic crop exporter. Though research continues to cement the claims that GMOs and organic crops are equally safe, the competition between modified and non-modified food sources both in the U.S. and in the broader geopolitical arena is as fierce as ever. Preference for or against GMO seems to be one of public opinion, and, if Russia’s biased media coverage is indeed true, it is fueled more by propaganda than scientific claims.